applications from the candidates belongs to Andhra Pradesh state for the recruitment of available 1600 Civil Police Constable, 300 APSP Constable and 300 AR Constable Govt Jobs in AP Police Department. Currently vacancies notification is given for the Police Constable Civil, Armed Reserved Constable and Prison Warder Constable for male and female candidates. These are new vacancies announced by AP Govt today (02-11-2018) which are approved. Selection for this Civil/AR constable Jobs recruitment of APSLPRB will be held in 3 stages. Prelims test, Physical Standard and Physical Tests followed by Mains Examination. Eligible candidates can apply online from 12-11-2018 to 07-12-2018 up to 00:00 PM through official website of SLPRB AP@recruitemnt.appolice.gov.in. Online applications only accepted by SLPRB Andhra Pradesh for the recruitment of Constables in Civil, Armed Reserved and Jail/Prisons Departments. For more information regarding this please see the information provided below for the SLPRB Recruitment of AP Police Constable Jobs. Written Examination Date: 06-01-2019 (10:00 AM to 01:00 PM ) Must have attend 1 hour before. 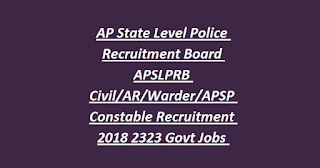 There are total 2323 vacancies available in this current recruitment of State Level Police Recruitment Board of Andhra Pradesh Police. For women candidates 33.33% reservations are applicable. For SC/ST and BC candidates 5 years of age limits relaxation is given. For the candidates belongs to OC/BC educational qualification is Intermediate Qualification. For SC/ST candidates SSC pass and the candidate must appeared intermediate first year and second year. Candidates belongs to OC/BC to pay Rs.300/- and for SC/ST Rs.150/- towards Application fee and Examination fee. The candidates have to pay the fee in any meeseva centers or ap or ts online centers. After payment the candidates have to update the payment details in online application form and submit the same. Selection for this recruitment of AP Police Govt jobs will be held in 3 different stages. Prelims exam will be conducted for 200 marks with 3 hours of duration. Exam will be objective type multiple choice questions only and syllabus is intermediate standard. Mains exam will be conducted for 200 marks for Civil Constable and Prison Warder Jobs. For AR Constable mains exam will be conducted for 100 marks and 100 marks for physical tests. 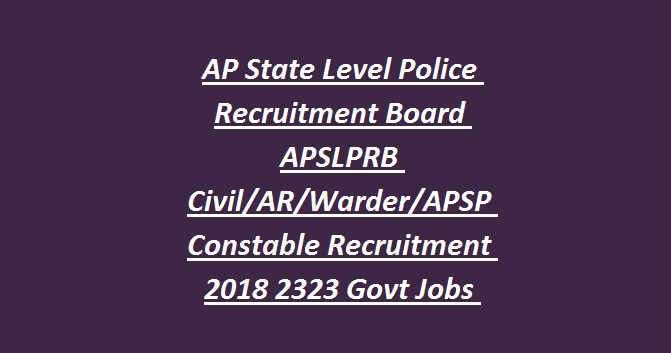 Eligible candidates have to submit the application form online using the official website of SLPRB Andhra Pradesh @ recruitment.appolice.gov.in. After payment of examination fee update the same in online application and submit on or before 07-12-2018. Click here to download the official notification and apply online here for SLPRB AP Police Constable Jobs. Click above for District wise schedule of PFT and PMT. For District wise vacancies please see the official notification.